The cathedral La Sagrada Familia in Barcelona. Pope Benedict XVI is scheduled to consecrate the cathedral on Nov. 7. BARCELONA, Spain -- The last time I visited this most magnificent Mediterranean metropolis, Francisco Franco still ran the country and everything and everyone in it. Back then even when the sun was blazing, the city seemed somehow sinister, darkened by constant clouds of state-sponsored repression and fear, overseen by steely-eyed, stiff-hatted Guardia Civil. Granted home rule after the dictator's death in 1975, Barcelona has changed dramatically over these four decades, and not just as a result of hosting the Olympics in 1992. So it was with some anticipation last fall that I got my first chance to form a second impression and was even more taken by the city I encountered. Simply stated, Barcelona has blossomed -- again. The evidence is amply evident almost any time of day along the Rambla, the wide, largely pedestrian promenade that runs a mile from the harbor to Placa de Catalunya, the great square that is the city's beating heart. Where to stay: Barcelona has an abundance of superb smaller hotels in historic buildings. The Regina, affiliated with and adjacent to the Pulitzer, half a block from La Rambla and the transportation hub of Plaza Catalunya, was a perfect base for our explorations. http://www.reginahotel.com. Long known as the "Grand Enchantress," the capital of the province of Catalonia has flowered into a vibrant, colorful, cosmopolitan center of culture, cuisine and commerce, resplendently Continental and yet fiercely distinctive. Set deep in 3,000 years of tumultuous history, the roots of this ancient seaport predate classical Rome and have encompassed every period of civilization since -- Gothic, Renaissance, Baroque and Art Nouveau -- and, somehow having avoided much of the 20th- century destruction that decimated other European cities, architectural artifacts from every era still stand shoulder to shoulder on Barcelona's medieval streets. In the past century, Catalonia's creative climate has nurtured such Modern artists as Picasso, Miro and Dali, all of whom gained international stature and left their mark in museums that bear their names. Yet perhaps Barcelona's most distinctive creative character was Antoni Gaudi (1852--1926), the quirky architect whose influence has been magnified far beyond the handful of local structures he created, mostly grand homes rather than civic edifices. Although the word gaudy predates the man by centuries, it's easy to think it was coined to describe his work. When Gaudi finished architecture school, the school's head said, "Who knows if we have given this diploma to a nut or to a genius. Time will tell." It proved an accurate prediction. Gaudi pioneered a Modernist movement where design flowed from nature rather than the intellect and form was superior to function. As much as they are buildings, Gaudi's creations are comprehensive works of art that can be inhabited, structures that despite their extravagant, often ephemeral appearance and commercial unsuitability, have endured and remained relevant. Almost all have been designated as World Heritage sites. So on our four-day sojourn last November, my wife, Sari, and I decided to get into some Gaudis in the only place in the world it is possible to do so. We began our exploration of five of the primary Gaudi sites in Barcelona with a visit to Parc Guell, envisioned as a private community set on a craggy hillside to the west with a commanding view over the city and the Mediterranean. Commissioned in 1900 by Count Eusebi Guell, a textile mogul who was Gaudi's primary patron, the architect spent 14 years constructing a network of pathways over the stony acreage, radiating from a pair of fanciful, gingerbread gatehouses and a columned pavilion, decorating them with offbeat monuments and animal shapes of contoured concrete and covered with elaborate, slightly hallucinogenic tile mosaics. Although sites for 60 homes were planned, only two were built, one of which served as Gaudi's residence for more than a decade and now houses a small museum of his memorabilia. A playful perfectionist, Gaudi had an artistic vision that included every detail of furnishing and decor. An architectural accomplishment but commercial failure, the estate was eventually turned over to the city. It is now a public park and an eye-opening introduction to a most creative mind. That afternoon, we called on Casa Batilo, a grand residence on the broad boulevard Passeig de Gracia a few blocks from Plaza Catalunya. Gaudi renovated the existing structure between 1904-10, transforming the entire six-story facade into a flowing ripple of glass and tile mosaics that look like a somewhat melted wedding cake topped with two bastions of colorful chimneys swaying above a blue-tiled roof. The exterior is Gaudi at his giddiest, and inside, as one of his few buildings open to the public, a way to inspect the unconventional interiors that make up a small Gaudi Museum. Several blocks farther up the Passeig on a commanding corner we found Casa Mila, or "La Pedrera" as it's more commonly called, which is Catalan for the quarry. That is certainly an apt description for the six-tiered apartment building, with an undulating, undecorated facade of rough chipped stone along both street fronts, topped by a froth of fancifully shaped chimneys that seem like spires extruded from a Dairy Queen machine. Still a functioning residence with a ground floor cultural center, La Pedera allows visitors access to an interior garden and a stairway to the roof top. The next day we searched out Guell Palace. Built on a side street just off La Rambla, this was Gaudi's first major architectural undertaking and the only project he started, in 1880, and completed, in 1887, although decorating took three more years. Executed as a showplace of pride for his primary patron, the textile industrialist Count Eusebi Guell, the palace demonstrates that Gaudi spared no expense in creating the ultimate urban experience of the time. The building has been owned and faithfully maintained since 1945 by the Barcelona City Council and is, we were told, the most complete record of Guadi's early artistic vision. Unfortunately, the palace was closed for renovation in 2006, except for the entrance hall and basement, which can be toured for free Tuesday through Saturday from 10 a.m. to 2:30 p.m., until the whole structure is re-opened later this year. We had saved the best for our last day. Gaudi's masterwork, the cathedral La Sagrada Famila (the Holy Family) towers over all of his other architectural accomplishments. Now, 84 years after his death, it remains a masterwork in progress. The project began in 1882 under the architect Francesc del Villar, who resigned the following year and Gaudi, just five years out of school, was appointed to continue the job. He re-conceived the cathedral's design and set about constructing the crypt that would be its foundation. 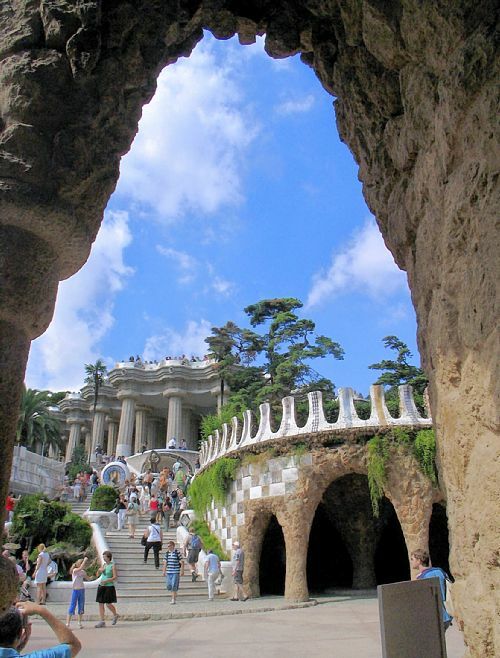 That was substantially finished by 1891, but other projects began to demand Gaudi's attention and progress stalled. By the time he turned back to the La Sagrada project in 1914, Gaudi's concept had grown for what he called "the last great sanctuary of Christendom." When asked about the long delay, Gaudi reportedly responded, "My client is not in a hurry." A devout Catholic, Gaudi imagined a structure that would be both resplendent with religious symbolism in every detail and equally representative of his naturalistic view of architecture with elements that seem to grow from the ground to heaven. His design envisioned an anti-Gothic structure consisting of 18 soaring towers, one for each of the Twelve Apostles, four evangelists, Mary and Jesus, all conceived in delicately filigreed cones of stone. The irregularly shaped columns that surround the main nave branch at the top into hyperbolic arches, like trees in a forest. Gaudi came to focus all his attention on La Sagrada, eventually moving into an apartment in the crypt, where he became something of a recluse. On June 7, 1926, at age 74, he was struck by a streetcar and, unrecognized, was taken to a pauper's hospital, where he died three days later. He was buried in the crypt. Realization of Gaudi's vision has proceeded in fits and starts since then, overseen by a succession of architects. The design challenges have been enormous and replete with controversy, both for technical reasons and because his building plans were destroyed during the Spanish Civil War. The soaring vault of the central nave was only completed in 2000, and present plans hope the whole project will be done by 2026, for the bicentennial of Gaudi's birth. Still, the idiosyncratic, uncompleted edifice has long been one of Spain's top tourism attractions. Unsupported financially by either official church or government sources, work depends on donations from private patrons and tickets purchased by visitors. 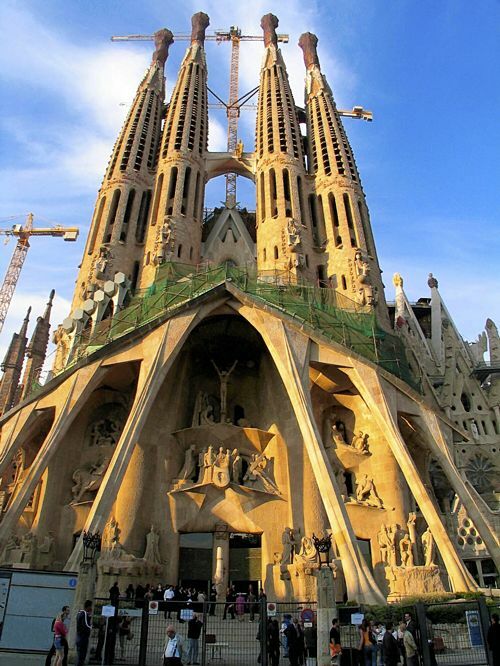 La Sagrada will certainly gain wider fame on Nov. 7 when Pope Benedict XVI is scheduled to consecrate the cathedral. As an ongoing construction site, La Sagrada is another worldly place that transports even nonreligious visitors. Whether it is absolutely faithful to Gaudi's vision may be subject to debate, but it is absolutely a product of inspiration, both divine and human.